Just a short little post today for fun. When I was first working on the aceo/gift tag idea, I took some that I had made to show to my book group. All were appreciative but a woman who is a fine weaver (she has a very large loom where I would have a studio) asked if I could make some in a smaller size that she could use as a tag on her weavings. She liked the larger ones but felt they were too large to use as a tag only. 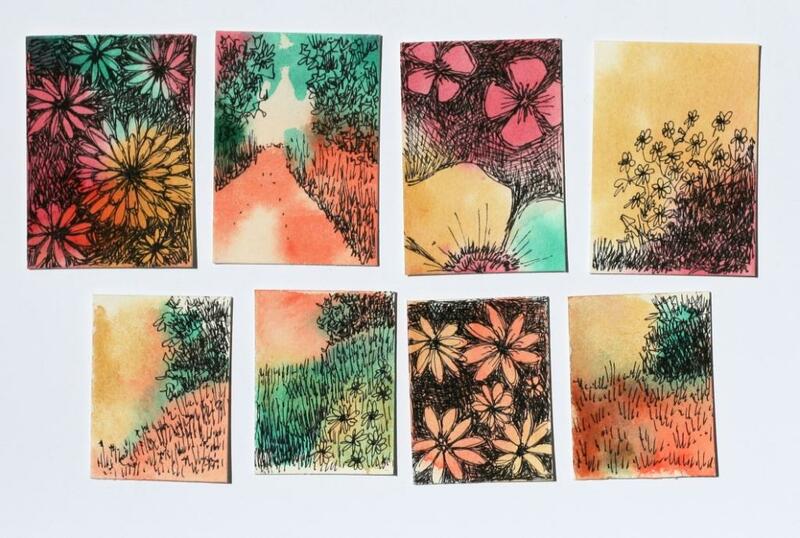 I said I would try, and the next time I had some down time letting a drawing rest, I cut a few of the aceo watercolor blanks in half. I also had a few odd pieces left from the big sheet cut down and recut them a little smaller. These will have to have some sort of hole punched because they are definitely to be used as tags, but I find that I don’t have as much a problem with it as I did deciding on the aceo sized ones. I think I will let her pick out some and list the rest as straight gift tags. It’s still raining here. I can’t say how much we have gotten in the last week, but it has got to be 6-8″ by now. Fortunately, we are up on a large hill and if we flooded there would be need of an ark. It is supposed to stop for a few days. I hope that those people so badly affected by all of the water will have a chance to dry out a little. 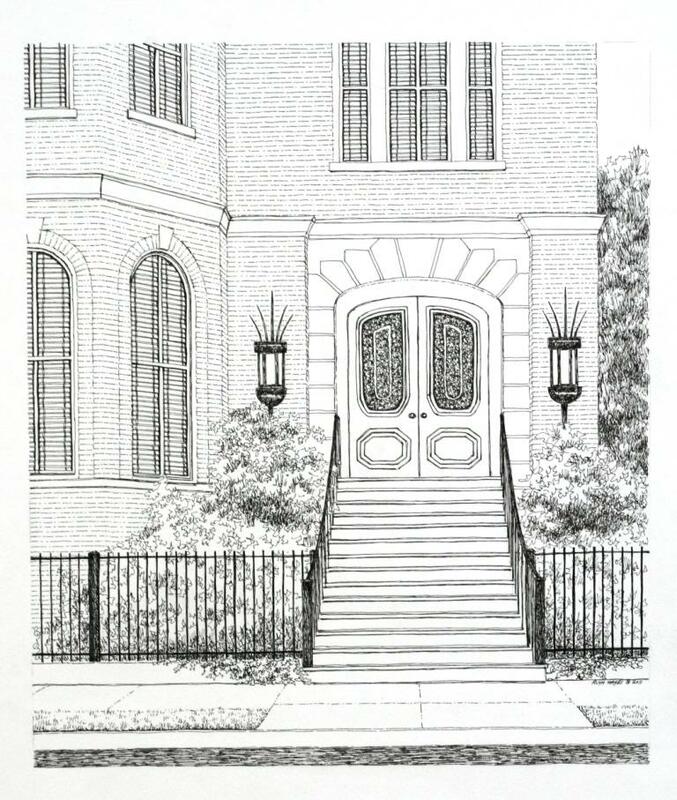 After the kids left on Sunday, I did spend time in the studio and finished my second entryway drawing. And lo and behold, the rain stopped and the sun came out long enough to take some decent photos. Here is the result. I may fiddle around with the pen and add a little more inking later in the week, but it looks fairly done for now. 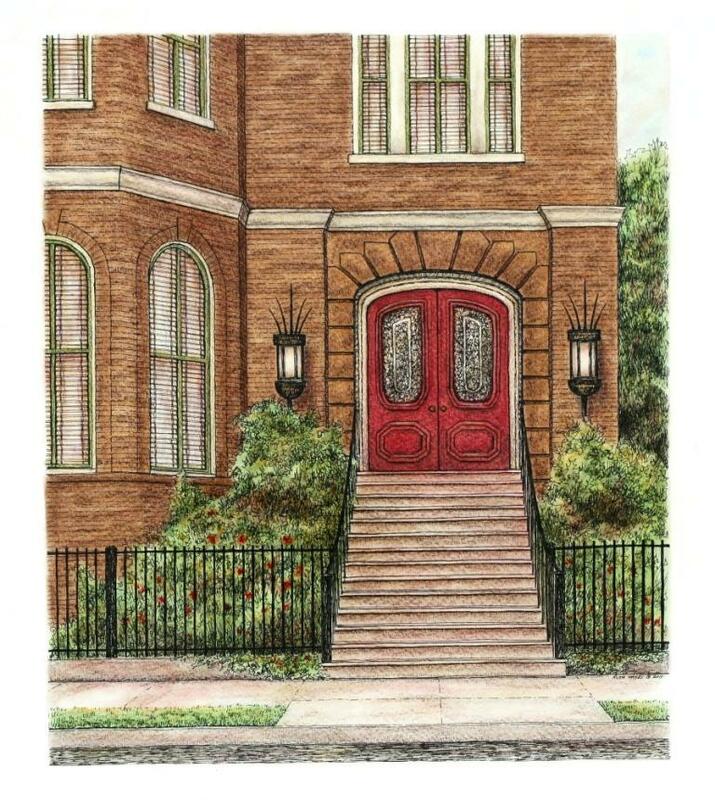 I especially like the maroon door. 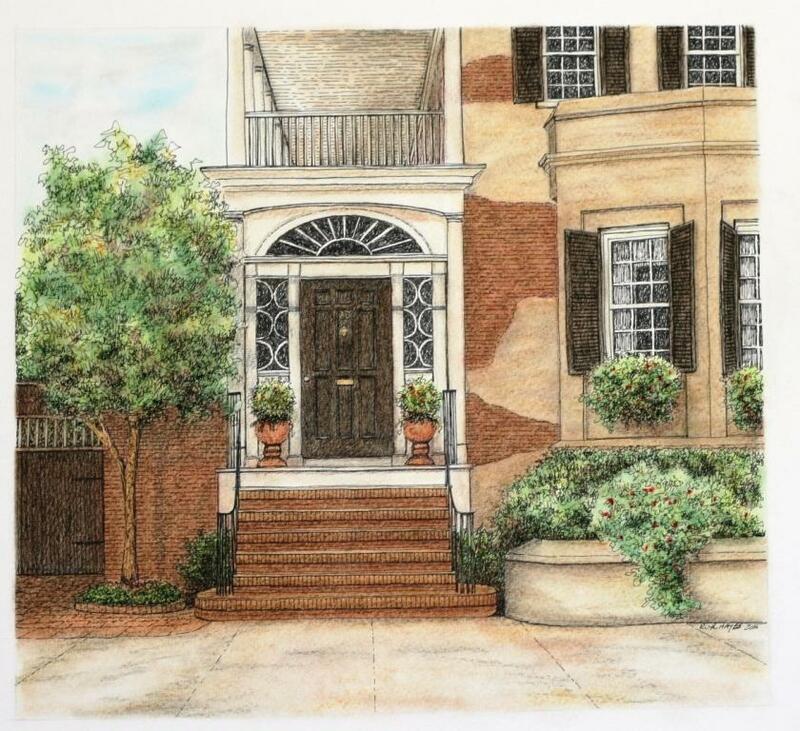 Its vivid hue livens up the brown brick facade. (And besides, my own door is almost the same color). Those sconces ar pretty spectacular too. Given the size of the door, I bet that they are close to five feet long. I used the pastels for basic coloring and shadowed some with the colored pencils. I have lined out the next drawing and may get to start inking later today. I picked out two more entryways to do so it will be easy to keep the work flowing for a while. Sometimes I spend as much time deciding what to do as I do drawing. I am enjoying having a theme to work with for a while. The studio work has gone moderately well this week. I have almost 90% of the color finished on my picture and I have decided to let it rest a while. There is company in the house and I am enjoying the busy times. 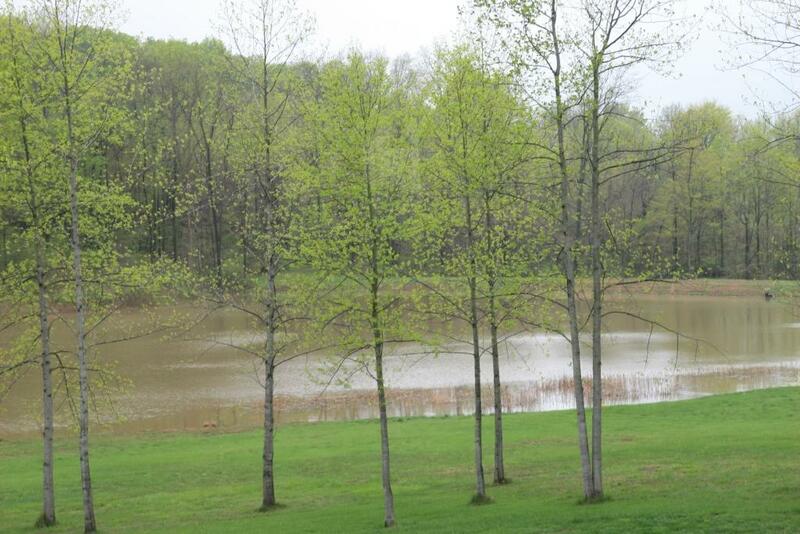 We have had a lot of rain in the last several days – probably over 4″ so far. The lake has filled up to the pipe overflow and I hope not very many fish end up going overboard and out. They are finally getting to be big enough to catch. There are predictions of up to 6″ more rain possible and there are already flood alerts statewide. The winter snowfalls seem to have stayed on in the form of rain. It is a far cry from last summer/fall drought. I did manage to finish planting all of the vinca I had on the slope next to the parking area. I saw the forecast of another week of heavy rain possible and just wanted to get it all in the ground. The wildlife has been abundant in the lushness of spring. We have seen a lot of deer as usual, multitudes of hawks, and squirrels and the turkey have begun to move about. No pictures yet but I am trying. We have seen several species of ducks on the pond including a pair of mallards. 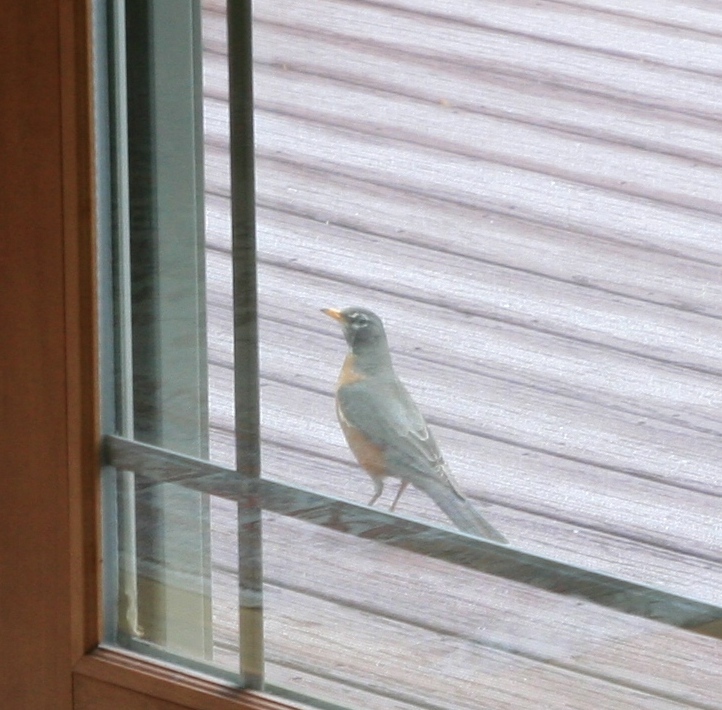 There has also been a delusional robin pecking at all of the windows around the house lately. He goes from window to window attacking his adversary to no avail. I have tried for the last three days to get a picture of him, but he does seem to know that we in the house are a bigger threat and I have had a hard time sneaking up for a picture. I finally got one and even as I type now I can hear him banging on the door below after I scared him off of the office window where I am. It would not be so bad but he is marking up all the windows and pooping on the deck in his zeal to drive off his rival. I guess that there is a reason for the phrase “bird-brained”. And excuse the photo placement. For some reason wordpress is not letting me place the pictures where I want to and just dumping them at the front no matter what I do. Aaack. I’m tired of fighting it. Aack. I almost didn’t get to post today. Monday evening as I was browsing the net I got a computer virus. Fortunately, I wasn’t connected to any of my own sites and the other computer was off, so the damage was limited to mine. The Geek Squad was able to turn around the fix in one day and I just got it back. Hooray (except for the cost). Anyway, I’m back on line and able to get at the files that I need to. I have been working on Southern Entry II for the last week. I really enjoyed drawing the last one and looked through all of my reference photos and came up with this. It too is grand, but in a different way. Instead of all of the glass around the entryway, it has major stonework around massive double doors. To get an idea of just how big they are, look at the placement of the door knobs. Yes, they really are that low. I’ll bet that those doors are easily 8 foot tall. I liked the grand staircase and the fact that the entry was softened by the large plantings behind the fences. This one also makes me wish that I could see what was behind those doors. I have obviously finished the preliminary inking and am moving on with the color. If all goes well, I will be able to finish it by the next post. It is a bit larger than the last one and is taking a little more time. I have to stand up at the table to work on the top portion which is not the easiest since the drafting table is a little slanted. Not quite tall enough, I guess. But I love my table. It has served me well for almost 25 years now. I have listed a few more aceo/gift tags and bookmarks in my etsy store so take a look if you have the time. I have had a great deal of fun doing them. They are quite freeing after the detail of the pen and inks. 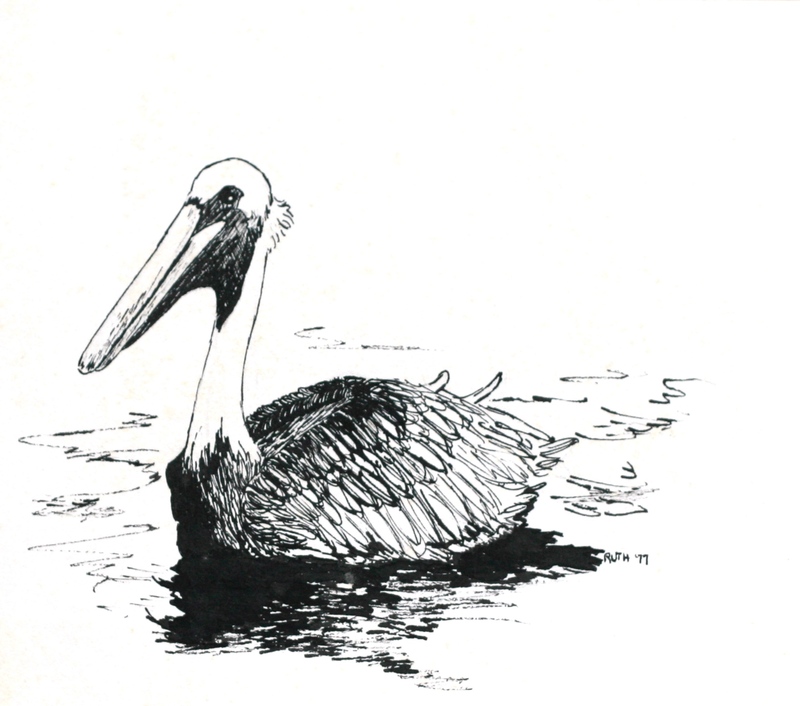 Why DO I like pen and ink ? The power of positive and negative space. A comment on my last blog concerning the unforgiving nature of ink drawing got me to thinking. Why does it appeal to me so much and form the basis for so much of my art? It is a rather permanent medium from the outset. Those lines are difficult to alter and I was never much one for trying to scrape the ink off or cover it with a white paint. More importantly, I could never figure out how to do that without being obvious. When there is an errant line, how can it be dealt without ruining the basic drawing. I have come to think that in dealing with a “mistake”, I was forced into developing a better understanding of positive and negative space. What could have more positive/negative space than black and white? When a balance between the two is achieved, the artwork cannot help but be strongly evocative. Consider the power of the line drawings of the old masters and the black and white photograph. How do we know that a piece of art is worth pursuing except that our initial drawing has a balance all its own, created by the lines we use? 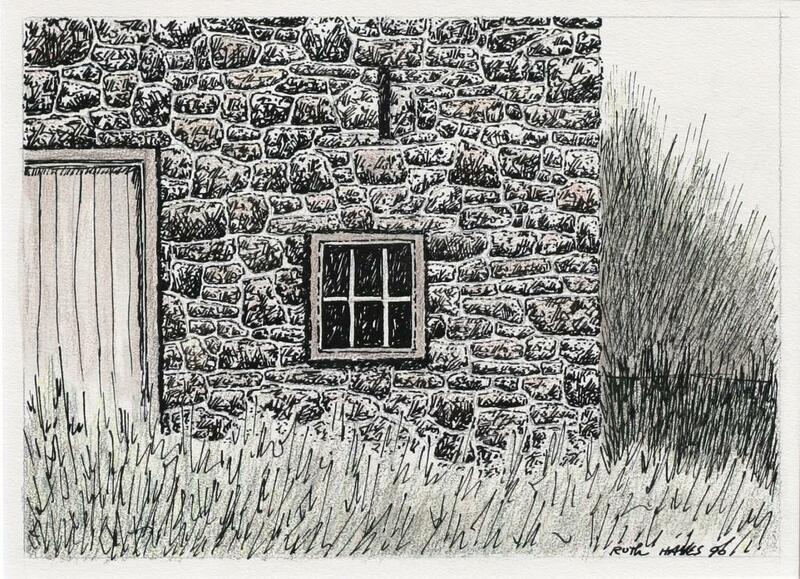 I started with pen and ink mostly because it was a small and easily moveable medium at a time in my life when that was an important consideration. I have grown to love it for its clarity and the definition that is gives to all the media that I use to overlay it. I love the softness that the pastels and watercolor contribute to my artwork, but I love the pen lines a little more and find it hard to be satisfied with what I do without them. I know this is just for me and that is why there are so many different media out there for us to use. We all have to find our own path to satisfaction and success. It can be a great journey. And besides, I am a Virgo and the sense of order and perfection of the black line is quite satisfying. Well, I had hoped to mark my 50th post, but of course I forgot, so I’ll mention it today on the 51st. And who counts the first one anyway when all that is really said is “Hey, this is my first blog page”. It seems so long ago that I started and had no idea what I was doing. This blogging thing is really something I had to take time and grow into. The great thing is that in only 6 months I have met so many kind and talented people. I look forward to it all, even if I had no idea what I was getting into when I started. It’s been so much fun so far. On the art front, I am inking the picture already. It is going to take a little longer as it is a bit bigger than the ones I’ve recently done. It looks okay so far and I will take a picture at the inked in stage if I remember (senior moments not withstanding). On the homestead front, everything is growing like crazy. 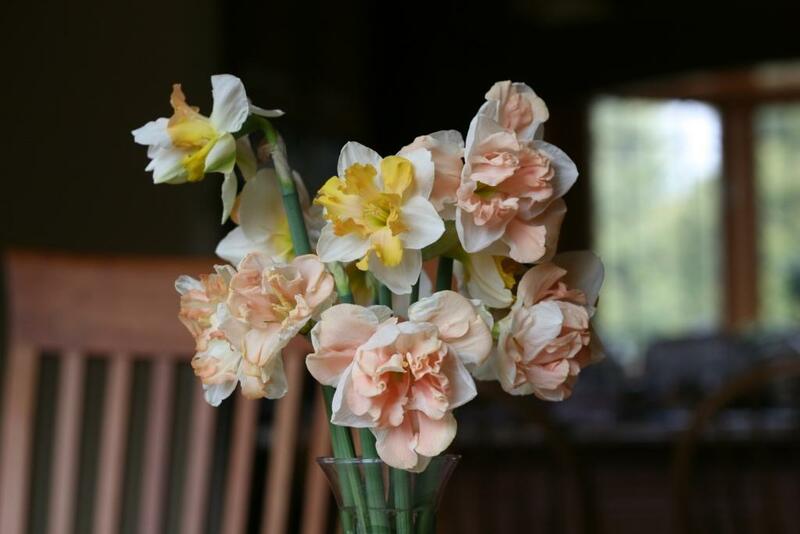 My daffodils are beautiful this year, the new forsythia had some blooms when I was afraid they weren’t going to make it through the drought and extra cold winter, the peepers are peeping, and the grass is growing. We have seen redwing blackbirds on the cattail remains, many hawks, and pileated woodpeckers repeatedly around the house. I am hoping for a picture of Tom or Jerry displaying to the turkey hens, but you know how that goes. Have to be in the right time and place. All in all it has been a very satisfactory spring after such a hard, hard winter. And to top it all, Jessica finished the foiling of the staind glass, so I thought another picture was in order. Now “all” that is left is to solder and frame it. Pretty nice, huh. We just got back from a few days away and it is amazing how much everything has grown in the mean time. The daffodils have been liking the cooler weather this year and have already lasted two weeks. The vinca has come back with a vengeance and is blooming like crazy. There were even a few blooms on the forsythia I planted last year. With the extended drought last summer and into fall, and then the long, cold, snowy winter, I was really afraid that a lot of plants wouldn’t make it. instead, all of the flora seems to have been invigorated this spring. Maybe all of the snow cushioned the cold and since we had so many smaller snows, the ground was slowly resaturated. I don’t know, but the flowers are really beautiful this spring. I did finish the color on the entryway before we left, but I wanted to let it sit for a short while so our short trip was perfect. The photograph is not the greatest because it is raining outside and I am depending on my studio lights. It is hard to get the balance of color and sharpness with just the fluorescents even though they are full spectrum. I will try again later and maybe tomorrow when we are supposed to have some sun and replace it with a sharper one. Sometimes the camera seems to have a mind of its own. I normally take 2-3 shots that should be exactly the same and they turn out slightly different. I am just not that great with the camera and usually let volume of pictures help compensate. Heck, if National Geographic takes a thousand pictures for its articles, why can’t I take a few dozen if I need to. 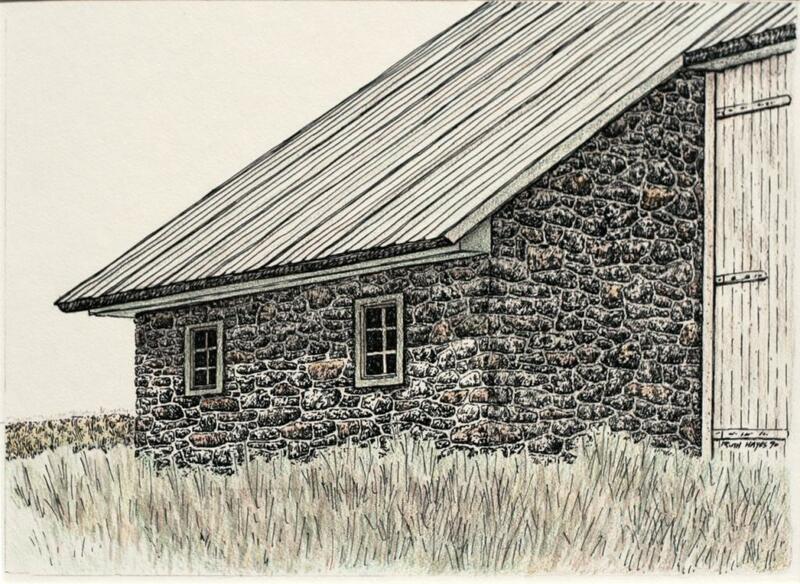 I am thinking also perhaps doing a few aceos with aspects of architecture and see how they turn out. I still have some of the last group left and it might be artistically freeing. I already have the latest picture lined out and that would be a good project when I want to let the larger picture rest. And a link to it on etsy.